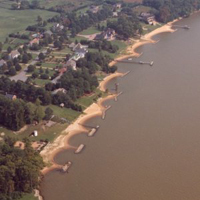 The developer took the chance on a breakwater system when only one system had been installed in Chesapeake Bay estuarine system. This early project, installed 1985, is 1,300 ft in length. The first phase consisted of a series of seven headland breakwaters and beach fill; the second phase was added to the upriver property two years later and consisted of 3 headland breakwaters and beach fill. The primary design method utilized the shore morphology between two existing cypress tree headlands and pocket beach that had been stable for 20 years. A breakwater unit was placed off each headland, and the natural pocket beach dimensions were used to template the remaining system.